In embroidery, couching might be called a "stitch" or you may think of it more as a process. Similar to appliqué, in which you are attaching fabric to the surface of the fabric you're working on, couching involves laying a section of embroidery thread (or a similar material) onto your fabric and stitching it onto the work. It can be worked on straight lines or curves and can even be used in any pattern in place of other outline stitches, such as back stitch or stem stitch. 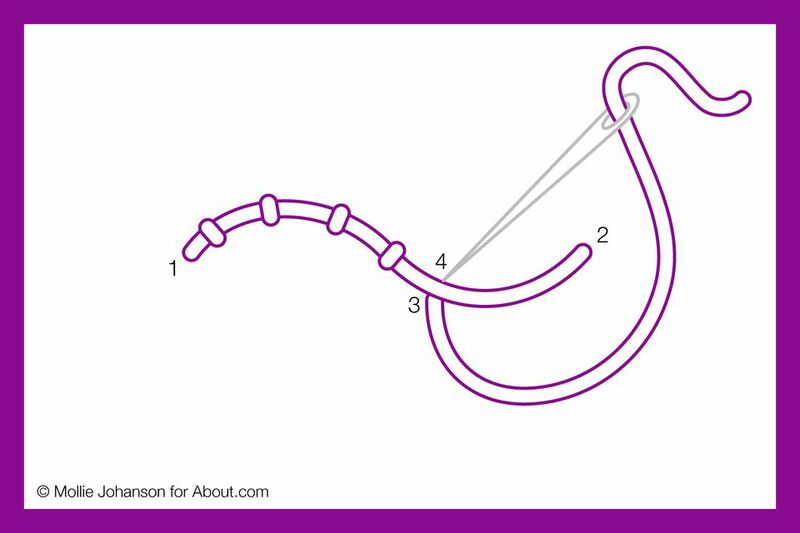 When working this stitch, you will typically have two pieces of thread going at once. They can be the same or a variety of colors, and use a different number of strands. To work couching, bring a needle with the main thread up at the beginning of the line you are working (point 1). Take the needle back down at the end of the line (point 2). If the line you are working is curved, keep the thread loose enough that you can move the thread along the line. You can adjust it as you work. Tack down the main thread with a second piece of floss. Come up on one side of the main thread (point 3) and down on the other side (point 4). Repeat the tacking stitches along the line of thread to secure it to the fabric. Couching can look a lot of different ways depending on how you work it and the materials you use. In the top example above, the main thread is six strands and the tacking stitches are worked in three strands of a lighter purple about 1/4-inch apart. Using a different color gives it a striped look and you can get really creative with this. Using fewer strands makes the tacking stitches more delicate. If you use matching floss and only one strand, the tacking becomes nearly invisible. The bottom example (shown partially tacked) is also six strands for the main thread. The tacking stitches are also six strands of the same color and they are very close together. Working the tacking stitches close together makes it similar to a very tiny padded satin stitch. For even more variety, try using yarn, ribbon or other materials such as DMC's Memory Thread. These will give your work some additional texture that you'd never be able to achieve with embroidery floss alone. Once you've practiced couching a bit, try adding it into your next embroidery project!